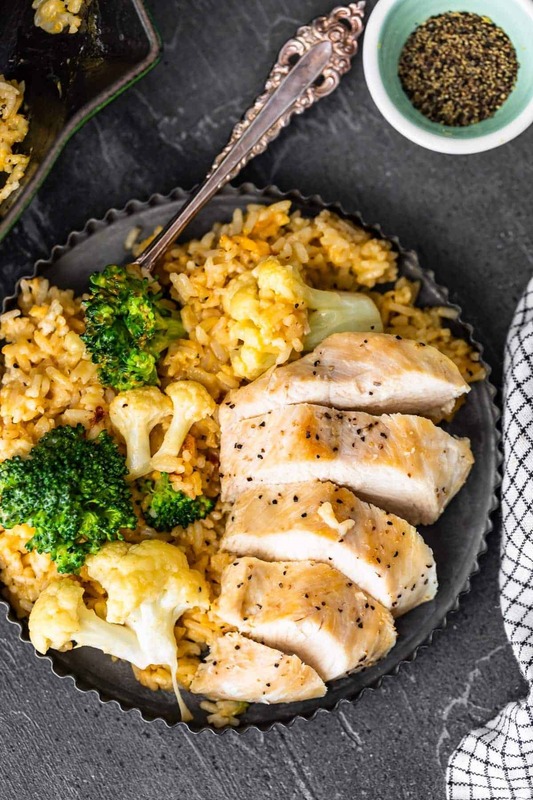 One Pot Cheesy Chicken and Rice is our GO TO simple weeknight meal the entire family loves. 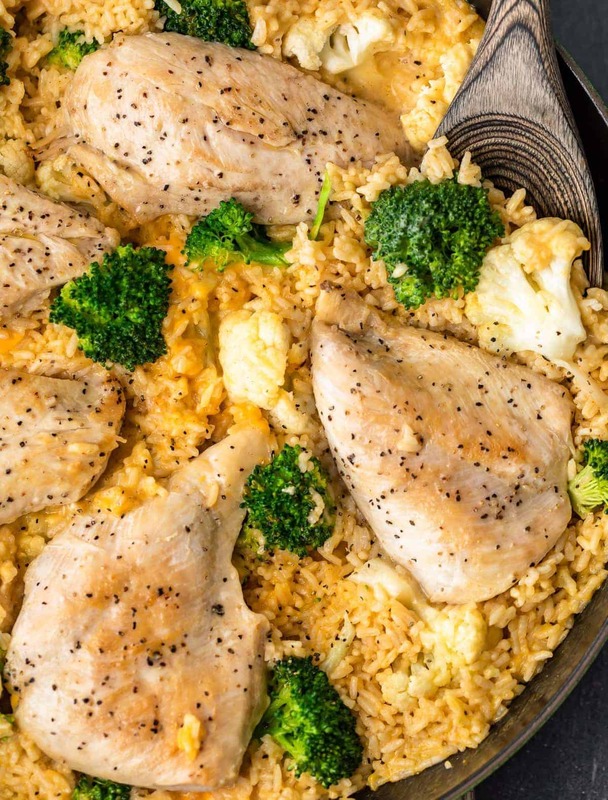 Cheesy Chicken and Broccoli is comfort food with none of the fuss. 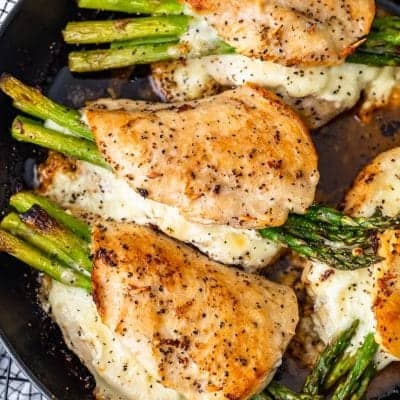 Creamy, easy, quick, and delicious! 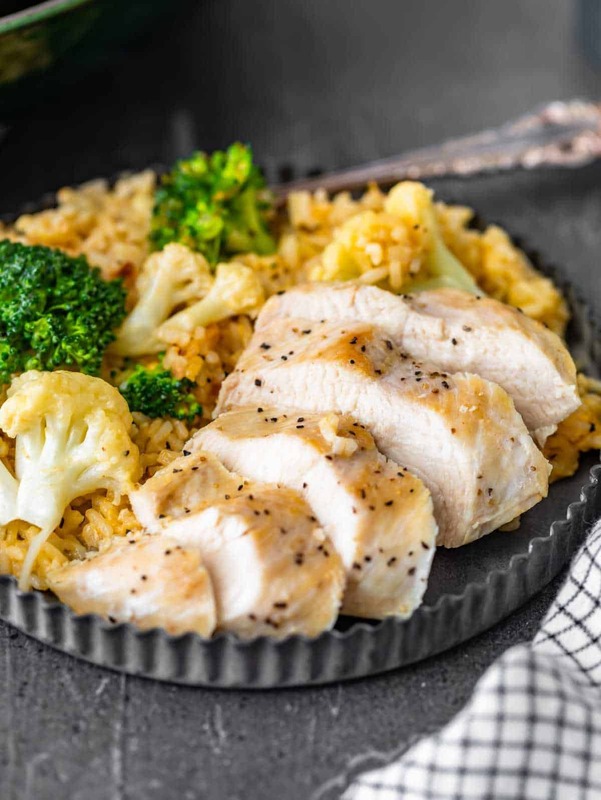 Chicken and rice is a classic favorite, but now let’s take it to the next level! 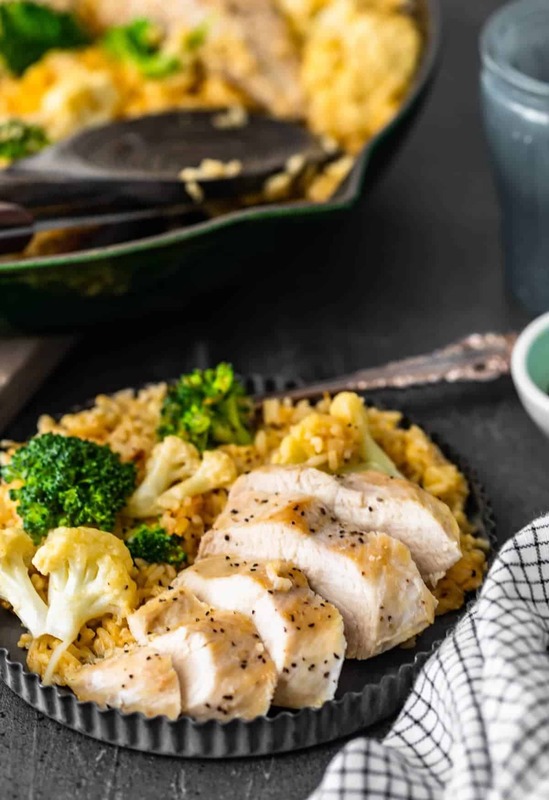 This cheesy chicken and rice recipe is loaded with Velveeta cheese, broccoli, cauliflower, and an array of spices that really turn up the flavor on a tried and true classic casserole dish! 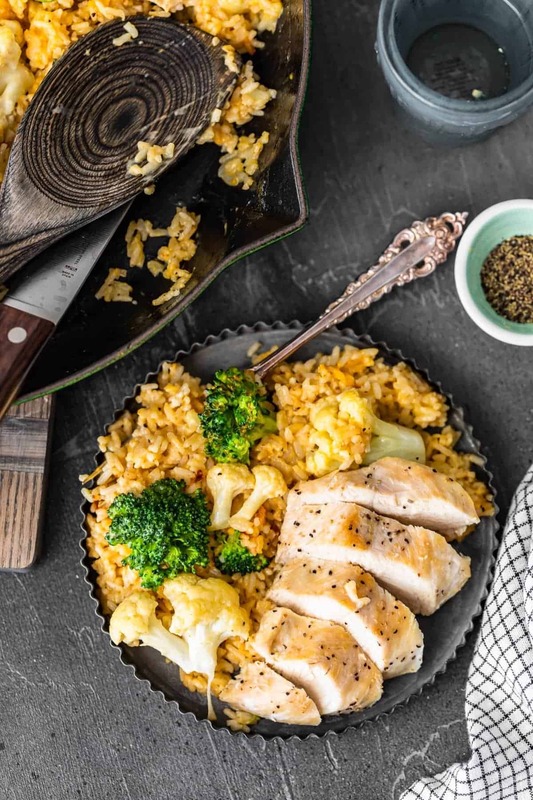 This beauty is made in just one skillet to easy your cooking chaos woes and lets you get dinner on the table in less than 30 minutes. It doesn’t get much better than a good comfort food dish with that many perks. 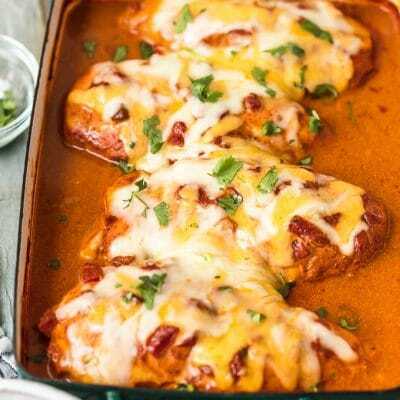 So, don’t miss out on a dinner you’ll love, and try this recipe now! 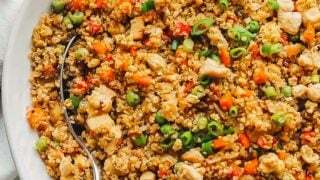 What Do I Need For A Chicken and Rice Casserole? 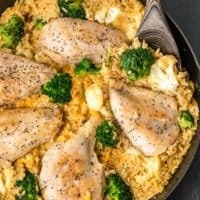 This chicken and rice casserole is perfect for beginners. 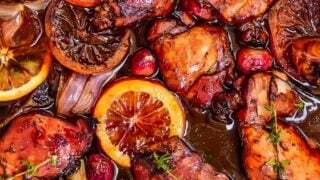 It allows you to get familiar with some basic cooking techniques without getting too crazy. 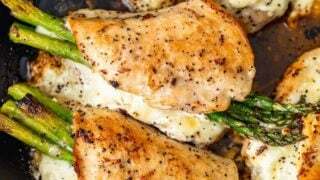 You just have to season the chicken with salt and pepper and add butter to a skillet over medium-high heat. Once melted, add the chicken and cook on each side, until fully browned and nearly cooked through. Remove the chicken and place on a foil tented plate to keep warm. Next, add the soup, chicken broth, paprika, and pepper to the skillet and stir to combine. Stir in the rice, broccoli, and cauliflower and add the Velveeta cheese, stirring to melt. 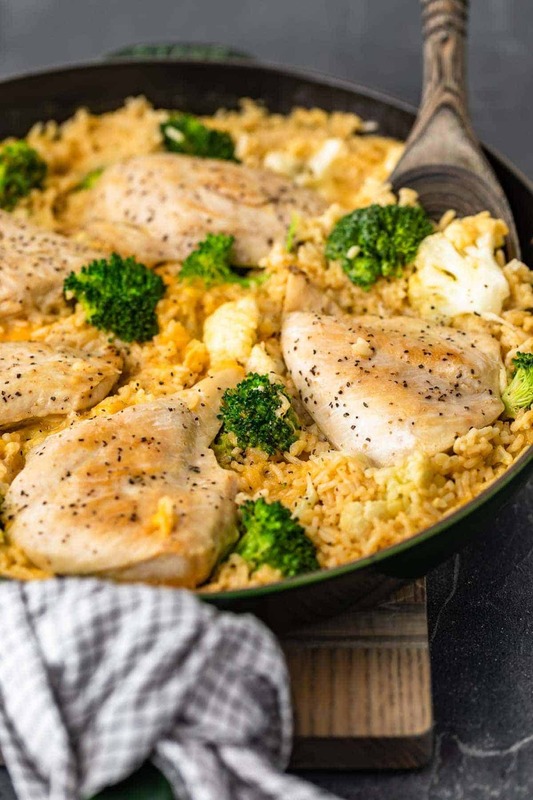 Once Velveeta is melted, return the chicken to the skillet and nestle in the rice. Cover and cook until fully done, serve and enjoy! Make sure the skillet is big enough: Be sure your skillet is at least 12 inches. We’re going to be making the whole recipe in this one dish so any smaller and you’ll have overflow, and a huge mess to clean up. 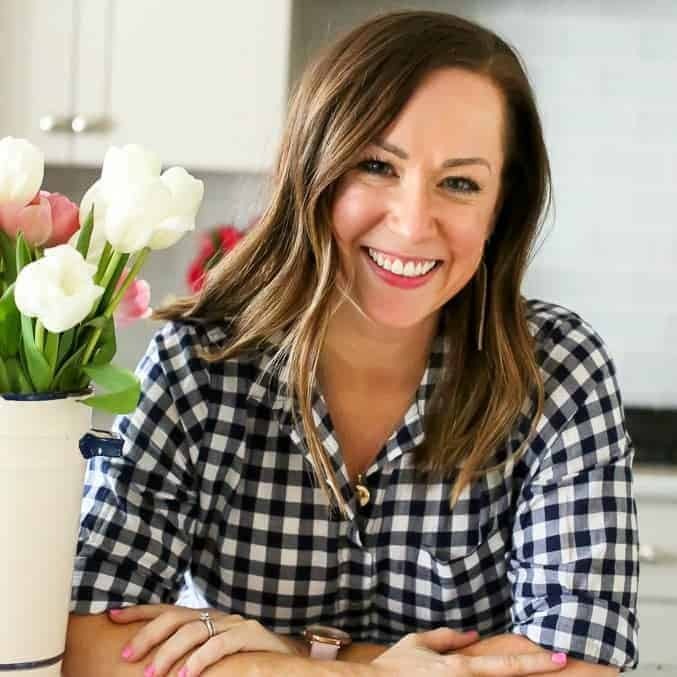 Prep ingredients before you start: To make the process go smoothly, I like to make sure all of my ingredients are prepped before I start doing any cooking on the stove. So make sure your chicken and veggies are all ready to go before you start adding anything to the skillet. Keep a close eye: Since this is a recipe that comes together so quickly, be sure not to leave the pan unattended for too long. Keep a close eye on the skillet to make sure nothing is cooking quicker than expected or burning. Don’t let the fancy term scare you off. Butterflying chicken is actually really simple, you just take your chicken and cut it lengthwise. It’s essentially just a way to get two thinner chicken breasts instead of one big thick one. If, you’re still a little iffy on how the process works, here’s a great video on How To Butterfly Chicken that will show you how it’s done. 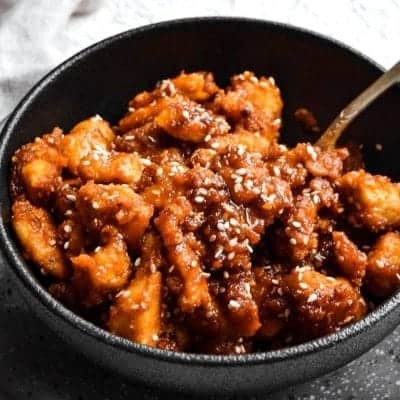 Whether you’re a family of 3, like us, or a family of 6 or more this recipe is perfect for you. It can easily be adjusted for more people and is great leftover if you’re serving it to less than 4 people. Not to mention, it’s a great way to sneak in some veggies in a way that doesn’t make picky eaters cringe at the sight of them. Talke about a win-win situation! Don’t Forget the After Dinner Dessert! No dinner is complete without a little something to top of the night on a (sugar) high note. With a dinner that takes no time, that means you have more time to whip up a little something satisfy your sweet tooth. I like to keep my desserts as simple as my dinners, so here are a few of my foolproof go tos for desserts everyone will love. Choose one or all 5 to make this week, I promise you won’t regret it! I know how hectic things can get which makes the thought of prepping dinner every night a daunting task. 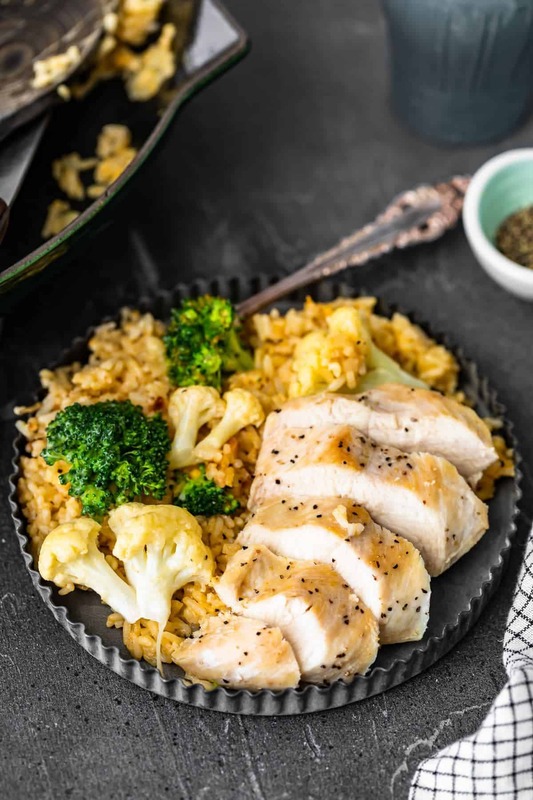 That’s why I love to keep things simple with my favorite chicken recipes that make prepping dinner a breeze. Trust me, I’m no cooking expert, so if I can easily make these recipes, so can you! 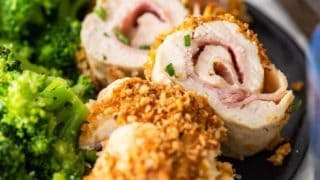 Some of our newest favorite easy chicken dinners! Marinated Cilantro Lime Chicken Tacos are a unique and tasty taco recipe your entire family will love. 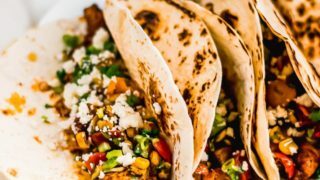 Corn, chicken, and fresco cheese make these Marinated Chicken Tacos a family favorite. 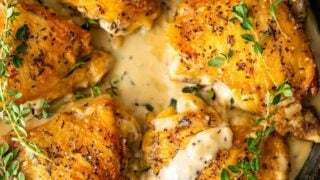 Chicken in White Wine Sauce is our favorite way to make Creamy Chicken Dijon! This amazing White Wine Sauce has 3 types of mustard and is sure to please. 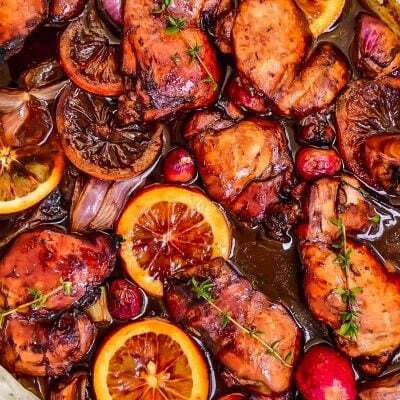 There’s nothing better than a recipe that doesn’t involve a million dishes to clean and is one of the reasons why I LOVE this recipe. It’s full of flavor, easy to make, and even easier to clean up. Be sure to save this one from when you’re in a time crunch but still want an amazing homecooked meal. I know you’re going to drool over it just as much as my family and I do. Add butter to a large (12 inch) skillet over medium high heat. Once melted, add the chicken and cook for 3-4 minutes per side, until fully browned and nearly cooked through. Remove the chicken and place on a foil tented plate to keep warm. Add the soup, chicken broth, paprika, and pepper to the skillet. Stir to combine. Stir in the rice, broccoli, and cauliflower. Add the velveeta cheese, stirring to melt. 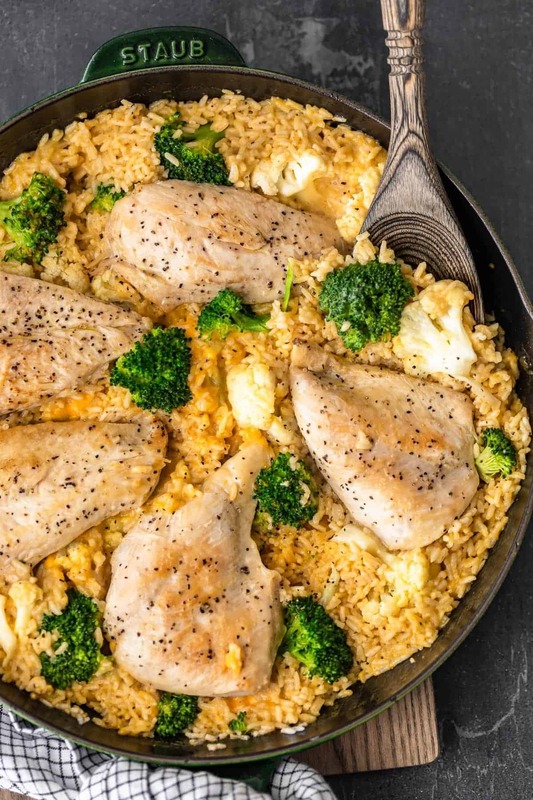 Once Velveeta is melted, return the chicken to the skillet and nestle in the rice. Cover and cook for 5 minutes or until internal temp on the chicken reaches 165F. We grew up on this dish, one of our family favorites! This was such a winning dinner in our house! So quick and I loved having less to clean up. This is one of our favorite recipes ever. It is sooo delicious. My kids adore it! Thank you so much! That makes me so so happy to hear. Thanks for letting me know. My family devoured this one. Thanks for a quick and delicious dinner! Such a incredibly delicious meal!! My family would LOVE this! !